Protein identification by mass spectrometry is one of the most important steps in proteomics. Proteins are typically digested into peptides prior to the mass spectrometry (MS) step. The most popular enzyme used for protein digestion is trypsin. 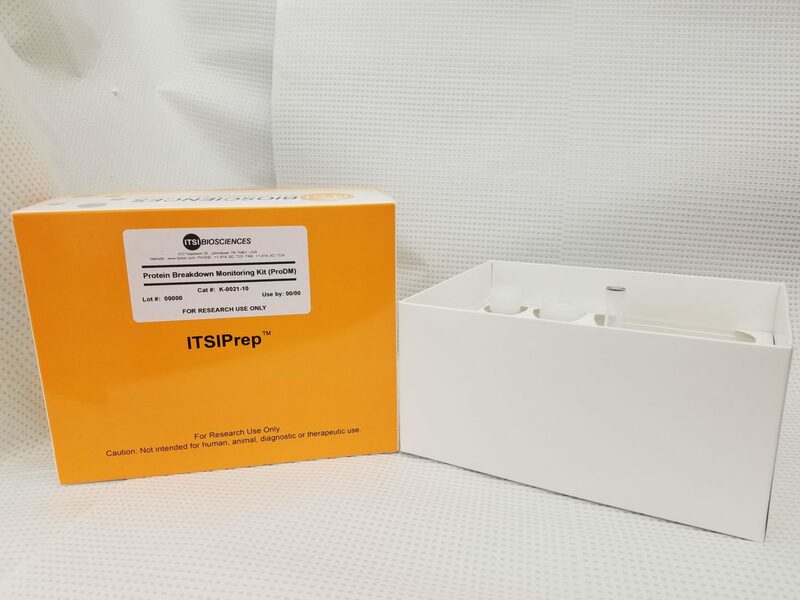 ITSIPrep Protein Digestion Monitoring (ProDM) Kit is the first kit to allow fast and accurate monitoring of the protein digestion step without performing gel electrophoresis. ProDM kit will allow researchers easily and quickly test the trypsinized sample to accurately determine the extent of digestion. This will increase the overall efficiency of the mass spectrometry by reducing the number of failed mass spectrometry experiments, and hence the overall cost of proteomics research. 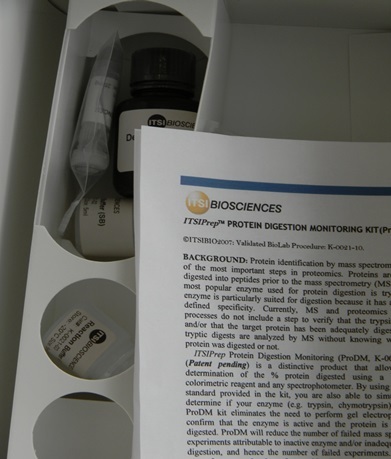 ITSIPrep Protein Digestion Monitoring (ProDM, K-0021-10) kit (Patent pending) is a distinctive product that allows precise determination of the % protein digested using a proprietary colorimetric reagent and any spectrophotometer. ProDM kit eliminates the need to perform gel electrophoresis, to confirm that the enzyme is active and the protein is adequately digested. ProDM will reduce the number of failed mass spectrometry experiments attributable to inactive enzyme and/or inadequate protein digestion. Use of ProDM kit to monitor the digestion of Bovine Serum Albumin (BSA) by trypsin. Panel “A” shows the spectrophotometric readings at various time intervals. Absorbance of the reaction mixture was measured at 585nm after addition of ITSIPREP Digestion Detection Reagent.